I have one recipe in all of these books I love to use – and the rest is just good reading. 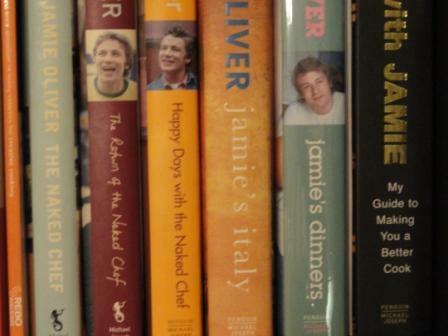 If you are starting a recipe book collection then I would recommend you buy two books: Cook with Jamie and Larousse. Those two will provide you with all the basics you need. 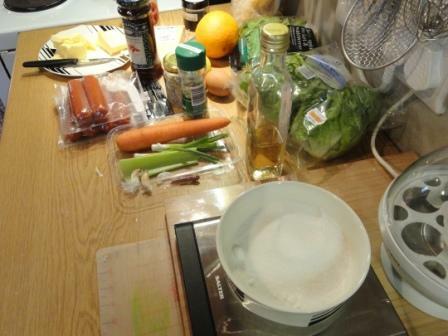 After that, buy a recipe book because you want to make one thing out of it if you need to! 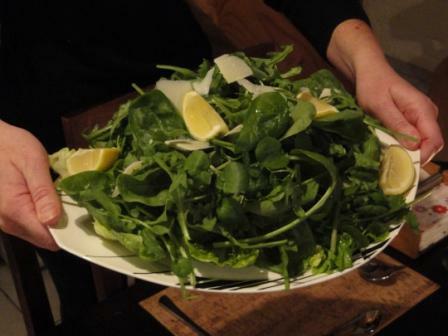 I was not one of the lucky bloggers to review Jamie’s 30 Minute Meals but I was determined to do this challenge as if there was a time limit. Dave was banned from the kitchen and I started the timer as soon as I was ready to cook – here are all the ingredients for Jool’s Pregnant Pasta. 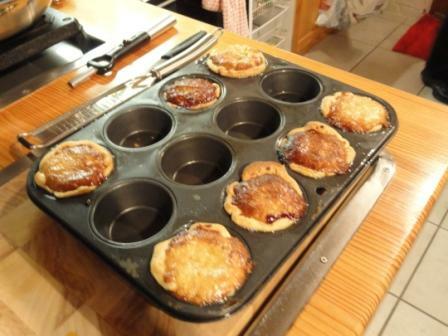 I also made the tartlets myself. 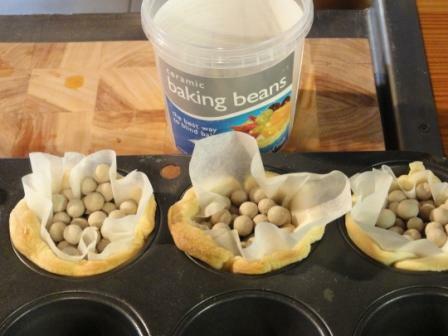 I do not have mini tartlet tins, so used a muffin tin instead. The recipe called for 6 but I made 7 as that is how much dough I took out. If I had not been following the recipe exactly, I would have mixed the frangipane base in the food processor – I have two mixing containers on mine, and I used the smaller of the two to ground my almonds for the recipe, and I could have added the rest of the ingredients and let the machine do the hard work instead of me. Mixing this by hand, with my shoulder problems was not very easy – and the end result that from ingredient to table, my meal took 32 minutes. Still a good achievement in my opinion. Here are the finished tartlets – and do not forego the crème fraîche, as you need something to cut through the sweetness of the jam. 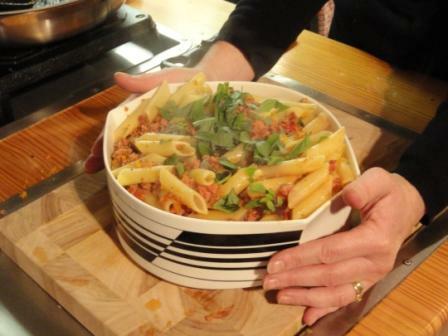 The pasta was really good, with our guests going back for their third helpings. I loved the way the food processor turned my Spanish style sausages into a rough minced texture. The fennel seeds added a fantastic dimension to the flavour. I did not have any fresh red chillies, and as I know my home grown chillies are really hot, I did not blitz them into the ingredients, but left them whole to impart some heat, without overpowering the dish. I will use this technique again for our weekly Tandy Tuesday pasta meal. The only thing about doing it Jamie’s way, is that there is no crew to clean up after me. I work tidier than this normally, and would rather spend an extra 10 minutes on my meal and have a clean kitchen 🙂 before we sit down to eat. However, this concept is great, and the next time we have meat for dinner I am going to challenge myself to Rib Eye Stir Fry. To see all the photographs from this event please click here. 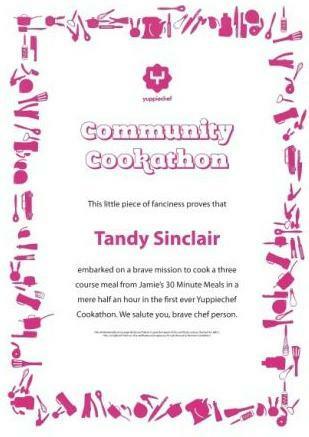 Fabulous dishes you did.. in record time too! Look absolutely delish!!! Almost forgot: Friday shoutout to David. It looks great, Tandy. I agree about prefering to take extra time to clean up. What is that pan-thingy-with-holes in the bottom left of the second photo? btw, I was glum last night, so I ended up on the Yuppiechef site and bought a ricer. I thought it was quite expensive … all your fault for telling me about it, but I expect I will get good use out of it once it arrives.